It’s always fun to pick out different properties to feature in my blog. This month is no exception. You won’t be disappointed with this gorgeous, four-bedroom home for sale in Breckenridge, Colorado that combines incredible mountain views with a stunning layout. If you’re in search of real estate that offers access to the mountains and privacy at the same time, you’ll love this house. It’s located at the end of a private drive, includes an oversized garage and plenty of room for family and friends. In addition, the home has been built with a lovely blend of natural stone, hardwood granite and designer tile. 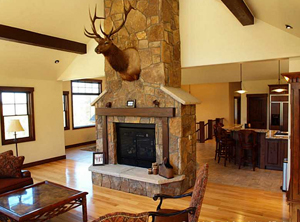 Plus, this Breckenridge house comes with three fireplaces, four bedrooms and an office/den area. Its spaciousness is accented with vaulted ceilings in the kitchen, dining room, living room and master bedroom as well. I also don’t want to forget to add that there is a separate family room that has a built-in wet bar. If you’re thinking this property must be off in the hills somewhere, it’s not. You won’t be far from all of the excitement in downtown Breckenridge, and you’ll still have access to the mountain and all the amenities you expect. That means you can experience privacy at home and still enjoy the local shops and restaurants at the center of town whenever you’re in the mood to go out. Basically, this home is a real treasure. I’m very happy to list it because it’s such a great find. In fact, I’m confident to say you’re sure to enjoy living here the moment you walk in the door. As you can tell, this fantastic home in Breckenridge has so many qualities that make it stand out. If you’d like to see this property in person, let me know. I can arrange a showing at your convenience. Give me a call and I’ll schedule a time that works around your schedule. Also, if you want to view other properties in Breckenridge or throughout Summit County, I’m happy to put together some properties that might meet your needs. You’re always welcome to look through the updated listings on my website any time as well. Then we can talk about the homes that interest you together.